"Jesus Christ in the womb of Mary prepared her by a profusion of grace to be the Mother of His Mystical Body as she was the Mother of His natural Body. He wished that we should receive from her the life of the Spirit as He had received from her the life of the body; that we should depend upon her for the maintenance and growth of our spiritual lifer as He depended on her for the maintenance and growth of His physical life. " Blessed William Joseph Chaminade firmly believed that we are all missionaries of Mary. He directed his followers to do everything under Mary's guidance. Amazing how things happen in our lives. Last week one of our students discussed, "Does God pursue you?" And then at today's celebration of the Eucharist the same theme was introduced. "Wow! Do you imagine the Creator of Heaven and Earth chasing you! To be chased by God can evoke an array of mixed emotions. I mean the Creator of all the seen and unseen is chasing me. I'm sure you might be asking, '"Are you sure He is chasing me?" or perhaps, "Why me? For what? What did I do for God to chase me? Am I in trouble? Well, yes. I mean yes, He is chasing you. Why? Because He loves you and wants to be part of your life. He wants to bless you and everything you do. He wants to heal you and make you whole. He wants to make a way for you, when there seems to be no way. He wants to wipe your tears and fill your heart with joy. The list goes on and on. Do you deserve this type of love? Probably not, but He does not love you because you deserve it or not; He does it because He is Love. This is the type of love that forgives, the type of love that never gives up or tires, does not judge or criticize. It's pure from the fountain of love itself. When you experience such a love as this, your whole life changes and nothing is ever the same." Be careful now because Jesus is chasing you! The good news is that it is not bad to be caught by Him! For Saint Benedict pictured above, silence was not a punishment, but rather a preparation for the presence of God. "Wait for the Lord; be strong, and let your heart take courage; wait for the Lord!" Sometimes it is helpful to come to God in silence and say:"I am here to be changed into whatever you like." In that silence we learn solitude, we learn to "wait for the Lord." Likewise, Blessed William Joseph Chaminade said:"the practice of absolute silence is an excellent means of arriving at the constant, active presence of God." This silence involved silence of the whole person. It means silence of words, of signs, of mind, of emotions, and of the imagination. It is here in the silence that our heart is focused only on God and with nothing but God. And finally, Blessed Mother Teresa said similarly:"Silence. We need to find God, and He cannot be found in noise and restlessness. God is the friend of silence. See how nature, trees, flowers, grass grows in silence; see the stars, the moon and the sun, how they move in silence . . . We need silence to be able to touch souls." Silence always require attention. Silence without engaging the mind will put us to sleep. Stay awake! "If we really want to pray, we must first learn to listen, for in the silence of the heart, God speaks. Jesus spent thirty years out of thirty-three in silence, began His public life by spending forty days in silence, and often retired alone to spend the night on a mountain in silence. He who spoke with authority, now spends His earthly life in silence. Let us adore Jesus in His Eucharistic silence! What better way to discern a vocation to religious life than spending time before Jesus Christ in the Blessed Sacrament, listening in the silence of our hearts; developing a personal and intimate relationship with our God. As we spend more and more time with Jesus in Eucharistic Adoration, to make Jesus the center of our life, we will grow in holiness, we will develop a stronger love for Jesus, and be able to feel His love for us. Mary's disposition at the annunciation is one of discernment followed by a firm commitment. Her participation in God's plan of salvation is a joyful "Yes!" This disposition of Mary is the basis for Blessed William Joseph Chaminade's spiritual method. "Blessed Chaminade taught his disciples the importance of silence: Silence of words, of signs, of the imagination, of the mind and of the passions." Jesus said to him "If you wish to be perfect, go, sell what you have and give to the poor, and you will have treasure in heaven. Then come, follow me." When the young man heard this statement, he went away sad, for he had many possessions. We are unwilling to give up our possessions. We are unwilling to give up our dreams. Wevare unwilling to give up our hopes and desires. This is why so many people have a hard time understanding their role in the Church. They want it all. They want to live their lives the way they want to and they want to have a role in the Church. Unless you are willing to sacrifice everything to follow Christ you will never understand our role in the Church. Can you do this? This summer the Province of Meribah reflected on a number of essential themes integral to our Marianist way of life. In particular we spoke about the quality and need of joy in our common life. For the Marianist way of life, we need joy in our consecrated lives. Joy is contagious. It breeds charity, warmth, caring, and fraternity. Joy, evangelical in its origin, needs to be cultivated. It is not simply laughing at a joke or a situation - it is more than that. Christian Joy is a perspective, an approach, a qualtity of relating with others. Joy takes the time needed- it requires time spent together, time away from the burdens and tasks of our very busy apostolate of education. Can I pull myself away from the drive and the need to accomplish - long enough to relax, to reflect, to read more spiritually or to pray more? We are all about the "long haul." Are we taking those steps to help sustain one another in joy for the years to come, to practice what Dorothy Day calls, "the duty of delight"? "Avoid connections to the world that promise much but deliver little, the quest for more pleasure, recognition and wealth. View your life as a personal vocation willed by God rather than a personal project." Blessed William Joseph Chaminade saw holiness as part of everyone's mission in life. It is a normal part of the Christian life and is a great grace. It is a gift that has been purchased at a great price. Mother Teresa was "right on" when asked how she felt being acclaimed as being holy around the world, she answered: "Holiness is not a luxury; it is a necessity." Similarly, Blessed William Joseph Chaminade wrote "we are called to be a people of saints." On August 8, Cody Abbey, Joseph Crapotta, Luke Homer, James Kovar, Edward Parisi, Charles Pileggi, Troy Sampson, Matthew Scarallo, Bro. Peter and Fr. 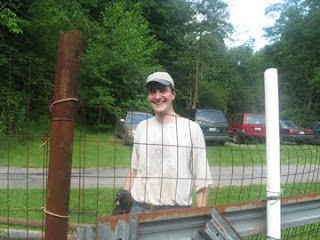 James began a one-week service project with Nazareth Farm in West Virginia. 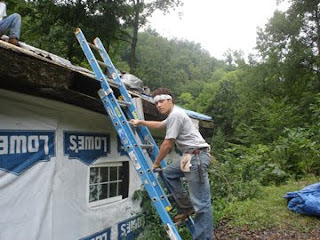 The group joined groups from Syracuse (NY), Centerport (NY), and Glenn Ellyn (Illinois), to perform home repairs in Doddridge County, West Virginia. Each day work crews consisting of students and chaperones from each of the different volunteer groups went off in different directions to work. 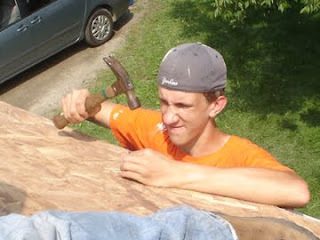 Projects included painting a house; replacing two roofs, installing two decks on a trailer home, and various chores around the farm. The students also learned much about proper stewardship of God’s creation through conservation of food, water, and electricity. 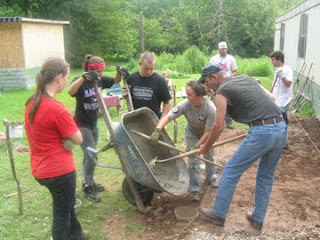 All lived simply during the week, using outdoor “bucket showers” and fasting from TV, IPODS, phones, etc. Chaminade’s group stopped at Baltimore on the way down and Philadelphia on the way back. They returned to Chaminade on August 16, fatigued but satisfied with a profound experience of prayer, simplicity, community and service. My Spirit Finds Joy in God My Savior! Blessed William Joseph Chaminade made the Marianist profession of vows a total consecration to Mary; that is, a total commitment to God according to her example to reinforce the grace of Baptism. Father Ernest, Father Garrett and Father Albert are pictured above during our Province celebration of the Eucharist. Brother Richard who celebrates his 49th year of religious profession today renewed his perpetual vows above and is pictured above. Pictured above is Brother Joseph who renewed his perpetual vows on August 18th this year. Today marks the anniversary of seven Brothers who professed their first vows on the feast of the Queenship of Mary. If you do the math, that is 325 Years of Marianist Religious Consecration to Christ and His Mother! Below is a reflection from Brother George who celebrates 48 years of religious consecration. "I have been blessed as a teacher of English as well as coach of Speech and Debate. Let me explain. Every year, as I begin teaching English, I explain to my students that the name for the Second Person of the Trinity (who later added human nature to his Divine nature, this becoming Jesus) is the Word. The Son is also the Word of the Father. That is a comforting thought for a Christian Catholic, especially for one studying or teaching English. Learning about a short story or about composition is essentially learning about how to use words effectively—to communicate, to touch someone else. We learn to use words in English class so that we can reach the Word, with a capital W. That is the link I see between teaching English and being a Catholic Brother. My students and I try to learn words to reach the Word. The same is true when I coach Speech and Debate. Take speech, for example. The student and I struggle to say the right words the right way—again, to reach the Word (of God). In Debate, the goal is the same. We look at both sides of a proposition (called a resolution) to see the truth contained in the statement. Then we research the position and argue it back and forth—all to reach the Word. I have tried to be faithful to this high calling—to use words to reach the Word. This is the source of my happiness as a Brother." This summer Brother Benjamin and Brother Karl attended summer courses at The College of the Atlantic in Bar Harbor, Maine. 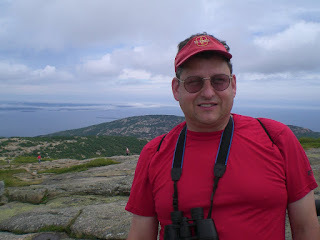 In the beautiful settings in Acadia National Park on the Maine coast they advanced their knowldege in life sciences. 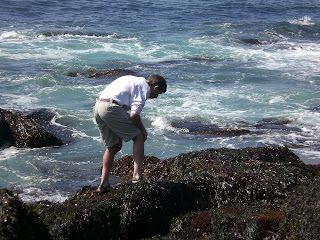 Not only did the extraordianry resources of coastal Maine and Acadia National Park provide unparalleled opportunities for natural history and field studies, but they are also a source of inspiration and solace. This program is a great assistance to Brother Benjamin as he continues his apostolate of education by teaching freshmen Earth Science. On the otherhnd, Brother Karl is a teacher of Math. How does a course in life sciences assist our apostolate for Brother Karl? Well, Brother is also a moderator for Science Olympiad. Our high school, middle school and grade school all compete in Science Olympiad. Each summer two of the Brothers from the Province have travelled to the Solomon Islands to assist Bishop Chris Cardone, O.P. in his Diocese. Today's blog is provided by Brother David. This past summer I had the opportunity and privilege to participate in Project MAST – Marianist Apostolic and Spiritual Training. This was the seventh year for this program of training that takes place in various provinces of the Solomon Islands. The main topics of my presentations involved the presentation of the Gospel of Matthew. This presentation involved explaining the background of Matthew and the audience for whom he wrote the Gospel. In addition, there was the need to explain some of the major themes of his Gospel. There were two major ideas that held together everything that was said. First of all I explained what it means for each of us to be a disciple of Christ. The word disciple means: someone who is learning. We all must personally learn what effect the following of Christ should have on the way we live our lives from day to day. I used Mary as a marvelous example of what it means to say YES to Christ, the Church and the call to holiness. The prophet Jonah is a wonderful story for the people in the Solomons. They are by location and need natural sailors. Jonah is a good example of someone who says NO to God. By the end of the story of this prophet we learn that he never says YES to God. The second major idea presented concerned the word apostle which means: someone who is sent. The major thrust of that part of the explanation was that Christianity is twofold – First: we are individually called to have a personal relationship with Jesus; Second: we are also called to live that relationship in a community. That relationship starts with a person’s family when they are young. As a person matures this relationship with God can be active in the wider communities of one’s spouse and children, one’s religious community or in the Church as an ordained priest. The youth and teachers of the Solomon Islands who participated in these MAST programs were very receptive to our presentations. "Because religious community is a Schola Amoris which helps one grow in love for God and for one's brothers and sisters, it is also a place for human growth." Above, the Brothers listen attentively during Father Garrett's morning homily. Above, Brother Stephen Vincent intones the responsorial psalm as the Community cantor. Above, Brother Robert Anthony proclaims the first reading at Mass. In our Community liturgy this morning we reflected on the Vatican document entitled "Fraternal Life in Community." In our Community we see our Brothers as an extention of that great Communion of Saints. Our Brothers are saints in Community. The Gospel of John and the tradition of the Society of Mary tell us that Community is critical. Living together as one family is our goal. Living together as Brothers is our task. Living together as members of the one true Church is the essential. This implies relationship and communion. And relationship and communion sometimes seems to go against instincts and nature. For us, our relationship and communion is best seen when we are "committed to ordinary and useful tasks." Today the Province of Meribah celebrates its 33rd birthday! It is also the 5th Anniversary of St. Martin DePorres Marianist School! The Brothers of the Province of Meribah gathered at the Chapel of Our Lady of the Assumption at the Chaminade Marianist Community. Sung Morning Prayer and Mass began at 9: 30 a.m. During Mass, Brothers renewed their vows of poverty, chastity and obedience. Above, Brother Thierry renews his temporary vows to Provincial Brother Thomas, while Brother Michael, Vocation Director assists. Above, Brother Daniel professed the following: "For the glory of the most Holy Trinity, the honor of Mary and to follow Christ more closely, I, Daniel Michael Griffin promise to God and vow to observe for one year the temporary vows of chastity, poverty and obedience, conformably to the Rule of Life of the Society of Mary." Above, Brother Stephen renewed his temporary vows. Brother John provided musical tones for the celebration of the Mass. As all the perpetual Brothers did Brother David renewed his perpetual vows with a simple kiss of the Scriptures. Brother Thomas instructs those renewing their temporary vows: Brother Daniel, Brother Nestor, Brother Stephen and Brother Thierry. At the end of the celebration of the Mass the entire Province of Meribah gathered around the Eucharistic altar for a picture! In his first "Rule of Life" for the Society of Mary, Blessed William Joseph Chaminade defines two characteristic virtues of a religious of Mary: a spirit of prayer and devotion to the Blessed Virgin Mary. Simplicity is the hallmark of Blessed Chaminade's method of prayer. The key components of his method of prayer are "faith, silence, and the importance of the Creed, Mary and practice." For Chaminade prayer is an exercise of faith, which takes revealed truth and roots it in the soul of the individual praying. Blessed Chaminade said, "The practice of absolute silence is an excellent means of arriving at the constant active presence of God." And silence involved the whole person: words, signs, mind, emotions and imagination. Blessed Chaminade understood meditation on the Creed as a focus on the whole mystery of Christ. It is is a review of Christ from birth to death to resurrection. To pray its truths meditatively is to realistically practice the life of Christ. The Christ life for Blessed Chaminade is rooted in prayer and devotion of Mary. Mary is our center, we pray as a community, with the community and for the community. The goal of all prayer of Blessed Chaminade is to be transformed into Christ. It is about an imitation to Jesus Christ, Son of God become Son of Mary for the salvation of all. So, what counsel could we give you than to take time, be silent and see what the Scriptures tell you about how to be closer to God? Many young people ask, "What should I do if I hear Christ calling me to follow Him in the religious life?" Pope John Paul II answered the question, "If you hear the Lord's call, do not reject it! Dare to become part of the great movements of holiness which renowned saints have launched in their following of Christ… Admire all God's works in the world, but be ready to fix your eyes on the things destined never to pass away." This certainly takes a great deal of courage for anyone! Perhaps we can reflect on it this way. You have been created by God with a desire in your hearts to do good in the world. Your gifts are from God and, through these gifts, He wants to sanctify you. Your decision to follow Christ in a radical way will enable you to grow into the person God created you to be. Pray to Jesus, Mary and St. Joseph. Pope Benedict in his homily on the Assumption stressed that our lives should be marked by this "sacred haste" in the knowledge that "God is always the priority," and no other priority should create such haste in our lives. Moreover he pointed to the passage from the gospel where Saint Luke “tells us that Mary, after the annunciation, 'got up and went quickly towards the mountainous region' to visit Elizabeth (Luke 1, 39). The evangelist - he continued - wants to stress that for Mary to follow her vocation, in docility to the Spirit of God, who has brought about in her the Incarnation of the Word, she must embark upon a new road and travel outside her home, allowing herself to be led by God alone". 'It is a journey - he continued - in which Mary, conserving and meditating upon the events of her existence in her heart, sees in them, in an ever deepening way, the mysterious plan of God the Father for the salvation of the world. " Today we commemorate the 26th anniversary of Brother Thomas' first profession of vows. We also commemorate the 30th anniversary of ordination of Father Albert. And finally in Alton, Illinois a Marianist graduate professed her first vows as a member of the Sisters of St. Francis of the Martyr St. George. Sister M. Paulina graduated from Kellenberg Memorial High School. May the Father and the Son and the Holy Spirit be glorified in all places through the Immaculate Virgin May. Today is a day of prayer. A day to pray for religious vocations. It is a beautiful day here at Founders Hollow, with blue skies and gentle breeze. The temperature is perfect. It is really a very pleasant day. Whenever I go for a walk I like to have a destination in mind (I'm the same way with driving), so I often will travel to a store to collect an item or two. Today I walked around the "block," which ends up being about a forty minute walk. 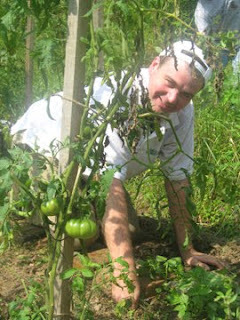 Our retreat each year offers the Brothers the opportunity to reflect on the gift of our vocation. Our religious vocation is received as a gift. How do we respond to that gift? What do we do with that gift? As Marianists, the many services that we render in Community are a response to our religious vocation. The mutual services are wide and varied. Sometimes the services are periodic and at other times they are daily, but they all make the common life meaningful and valuable. Daily cooking isna service that each of the Brothers takes as an opportunity for creativity. Doing the dishes is a task of necessity. Even folding the laundry is part of the daily services that we render to each other in Community. The attitude we take when we do these mutual services can make these opportunities tasks of joy and happiness, if done as a response of gratitude for our common call to follow Christ and His Mother. Happy birthday to Bro. 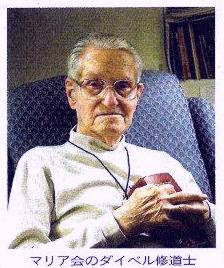 Francis Deibel of the USA Province who celebrates his 101st birthday today! Brother Francis has been a Marianist since 1926. He had worked as a librarian for 48 years at the University of Dayton. Congratulations from the Province of Meribah! "Religious communities are a living sign of the primacy of the love of God who works wonders, and of the love for God and for one's brothers and sisters as manifested and practiced through Jesus Christ." "Prayer needs to be seen also as time for being with the Lord so that He might act in us and, notwithstanding distractions and weariness, might enter our lives, console them and guide them." "For religious, communion in Christ is expressed in a stable and visible way through community life. " "Religious life cannot be sustained without a deep life of prayer, individual, communal, and liturgical." "The religious who embraces concretely a life of total consecration is called to know the risen Lord by a warm, personal knowledge, and to know him as one with whom he or she is personally in communion: "This is eternal life: to know the only true God and Jesus Christ whom he has sent" (Jn 17:3)."